Welcome to my home in Cyberspace! Click my pic anytime to go to my homepage. Carolyn Richards has been singing country and gospel music all her life. She has entertained people in her region since 1990 receiving accolades from fans and peers alike for her vocal ability. In 2003, an independent organization rated her #96 of more than 3500 vocalists worldwide. 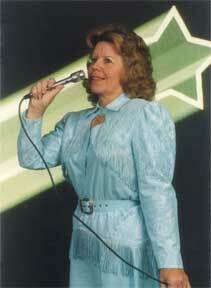 Click her picture below to listen to songs from her "Tribute to Patsy Cline" album. Carolyn Richards and her husband, Dave Butcher, have joined together under the name "Spiritual Road" to spread messages of Faith, Hope, Love, and Joy. They have presented programs in churches, gospel sings, and other venues from Maryland to Idaho, Montana to Texas, and back home in southeastern Ohio. They are lifetime members of the Country Gospel Music Association and have several awards from their peers.